Edition 50. Signed and titled in pencil. Image size 9 3/4 x 6 3/4 (248 x 171 mm); sheet size 15 1/8 x 11 1/2 (384 x 292 mm). A fine, clean impression, on off-white wove paper, with full margins (2 to 3 3/8 inches), in excellent condition. 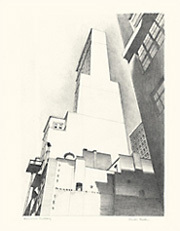 Exhibited: Icons of Industrial Expansion: American Precisionist Prints, 1925-1941, Baruch College,1999. The American Scene: Prints from Hopper to Pollock, The British Museum, 2008. Reproduced in: A Century of American Printmaking, 1880-1980, James Watrous, The University of Wisconsin Press, 1984; Whistler to Weidenaar: American Prints 1870-1950, Museum of Art, RISD, 1987; The American Scene: Prints from Hopper to Pollock, Stephen Coppel, The British Museum, 2008. Gordon 6. Edition 100. An unsigned proof impression apart from the numbered edition. 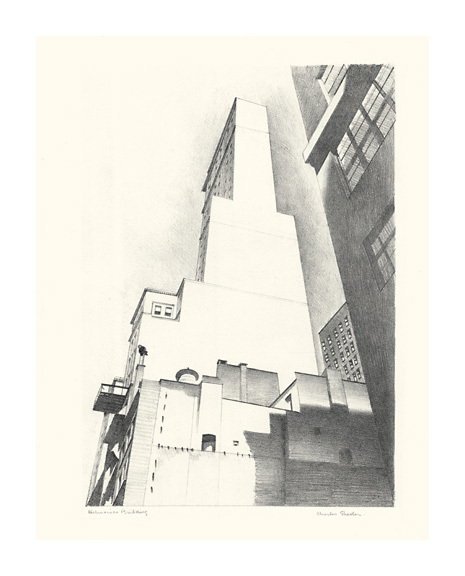 Printed by Floriano Vecchi, with the ‘Library of Floriano Vecchi’ blindstamp in the bottom right sheet corner and accompanied by the booklet Sheeler Retrospective Exhibition, signed and dated in ink by the artist, on the opening page. Image size 6 3/16 x 8 11/16 inches (157 x 221 mm); sheet size 10 7/8 x 13 1/2 inches (276 x 343 mm). A superb, clean impression, with fresh colors, on a large sheet of cream wove paper, with full margins (2 1/8 to 2 3/4 inches); in excellent condition. 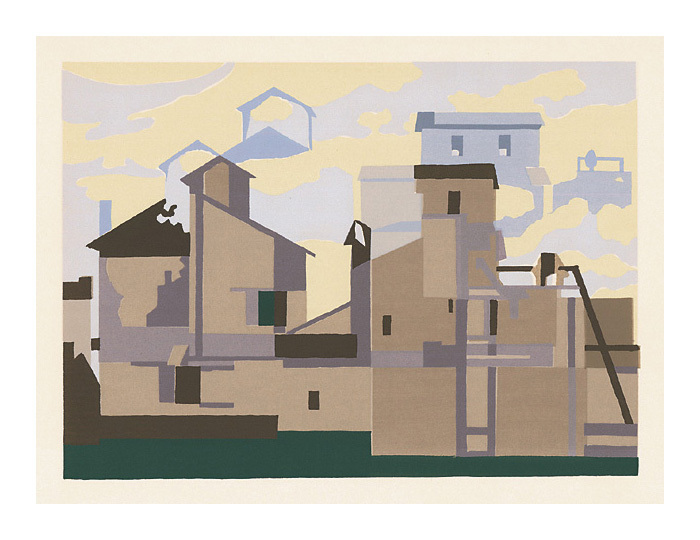 Architectural Cadence was produced as a tipped-in insert to the exhibition catalogue Sheeler Retrospective Exhibition (University of California, 1954). The catalogue includes a forward by William Carlos Williams, essays by Bartlett H. Hayes, Jr. and Fredericks Wright; 47 pgs., and 28 illustrations (5 color). Tiber Press, founded in New York City in 1953 by Floriano Vecchi and Richard Miller, specialized in fine art silk screen printing. The press produced impeccably crafted screen prints by leading abstract expressionist artists, including Joan Mitchell, Grace Hartigan, Alfred Leslie, and Michael Goldberg. 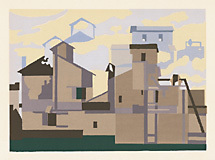 Other artists including Charles Sheeler, Stuart Davis, and Ben Shahn, also worked with master printer Vecchi to create complex and sophisticated serigraphs. Illustrated in A Spectrum of Innovation: Color in American Printmaking, 1890-1960, David Acton, 1990; with extensive commentary by the author.. Collections: Cleveland Museum of Art, Fine Art Museum of San Francisco, Amon Carter Museum.